The United States and China have agreed to a trade deal that will allow American beef and natural gas exports to flow into China while opening up the U.S. market for poultry and Chinese banks, U.S. Commerce Secretary Wilbur Ross announced Thursday. The agreement will enable U.S. beef exports to flow directly into China for the first time since 2003, while the United States would issue a proposed rule to allow Chinese cooked poultry to enter U.S. markets by July 16, Ross told reporters at a briefing. The deal will also open up the Chinese market to U.S. electronic payment providers, help Chinese lenders gain broader access to the U.S. financial market, and allow U.S. exports of liquefied natural gas to China. The deal marks the first results of trade talks that began last month after President Donald Trump and Chinese President Xi Jinping's meeting in Florida. Trump made renegotiating trade terms between the U.S. and China a key campaign promise and said last month he hoped to make progress with China in the short term. Ross said that the initial agreement was a "herculean accomplishment" that would help "bring down" the U.S. trade deficit with China, though he did not provide a precise estimate. Trump railed against the trade deficit during his campaign and pledged to reduce it as president. Although he has publicly suggested imposing drastic measures such as tariffs on Chinese imports, Trump has instead led toward bilateral negotiations thus far. On Friday, Trump hailed the agreement, tweeting, "China just agreed that the U.S. will be allowed to sell beef, and other major products, into China once again. This is REAL news!" Ross said that there should be an impact on China's trade surplus with the U.S. by the end of this year and that Beijing could negotiate any type of contract including long-term ones. Observers hailed the agreement as a positive initial step toward more U.S.-China deals and renewed comprehensive economic dialogue. The deal could lead to new opportunities for the U.S. agricultural, energy and financial sectors, which have often struggled to gain a foothold in the Chinese market, Joshua Meltzer, a senior fellow in the Global Economy and Development program at the Brookings Institution, told CNN. However, Meltzer expressed caution, saying that China has "made a lot of positive commitments that it hasn't followed through on" in the past. "It remains to be seen how much of these turn into real market access," he added. 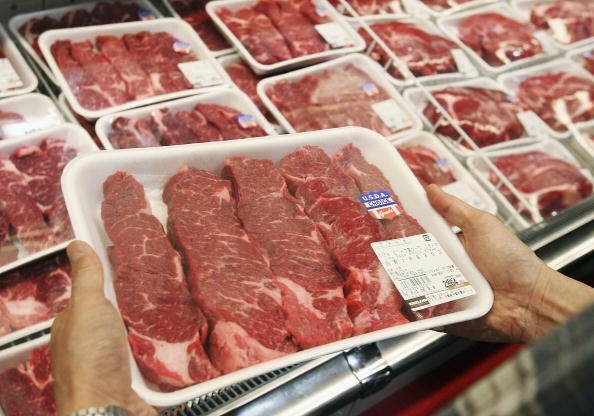 China imposed an import ban on U.S. beef in 2003 due to a case of bovine spongiform encephalopathy (BSE), or mad cow disease, in Washington state. It has since partially lifted the ban last year, but few purchases have been made. U.S. companies have also complained of high barriers to entry to the Chinese market, while their Chinese counterparts have been accused of hurting American manufacturers in part as a result of government support. Trump has accused China and other countries of unfair trade practices and has pushed for investigations into foreign trade abuses.